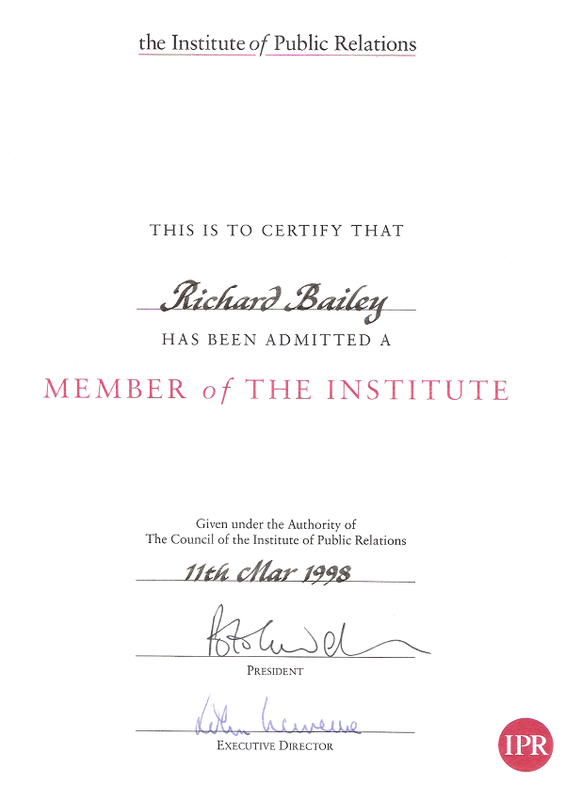 I have been a member of the Institute of Public Relations (now CIPR) since early 1998. That’s almost 20 years – and long before it achieved the Royal Charter in 2005. A Fellow since 2013, I am attending the Fellows’ lunch in the House of Lords this week. So now is a good time for a moment’s reflection. The rules have since changed but when I became a member I did so the basis of having worked in the business for ten years. So my twenty year anniversary also marks a thirty year association with public relations (longer than the lifespan of many of the people I teach). I’m not claiming wisdom simply based on longevity, but I do hope to have achieved some perspective. I am not alone: I see that Cambridge-based consultant Roger Darashah has noted the twentieth anniversary of his business by charting what has and hasn’t changed in that time. Twenty years ago I was chief press officer within the corporate affairs team of a stock market listed British technology firm. Originally the scientific research arm of the UK government’s Atomic Energy Authority, it had been the last privatisation of that long period of Conservative government that started with Margaret Thatcher in 1979, was surprisingly extended by John Major in 1992, and ended with Tony Blair’s Labour landslide in 1997. Two thoughts on this. One is that chief press officer was an important job commanding a good salary back then. It now sounds marginal and old-fashioned. We had email and the internet in 1997 – but we didn’t have Google, Facebook or Twitter. Media relations meant print and broadcast, not digital or social media. British innovations in technology were sufficiently rare to merit reports in national newspapers and on BBC national radio and television channels and a firm with projects and personnel from Dorset to Dounreay was guaranteed lots of local media attention. While my work as an educator defines my career, I can see in retrospect that I had reached a career high in my early to mid 30s – and suspect that’s true of many people in public relations. The other reflection is that though my expertise was very much the media relations subset of public relations – and I was having to learn quickly the other aspects of corporate communication – context and timing are key to public relations jobs. This was a newly-privatised business complete with a stock market listing and a need for investor relations advice and competitor and market analysis, but most of my colleagues had been there when it was a public sector organisation and worked to different principles and timescales. I had to sign the Official Secrets Act on joining (and subsequently delved into the archives to learn some chilling and heroic Cold War stories). I learnt that it’s easier to discuss innovation than to effect change. That people, culture and organisations are more complex than machines. That’s why internal communication is so important and so challenging. I learnt that the future is unpredictable. The share price was soaring in 1997 and there were parliamentary questions claiming that state assets had been sold off too cheaply. Yet that market sentiment later evaporated, the share price stagnated and the firm no longer exists as an independent business. I had chosen to leave by the end of that year, another case of good timing. In retrospect, I had been living through a golden age for public relations work. The wave of innovation introduced by the personal computer in the 1980s and the internet in the 1990s led to a booming technology PR sector. Privatisations and market liberalisation meant this was a good time for entrepreneurs. Startups tended to follow the Microsoft model of a PR-led strategy (Apple, a marketing success story, did not reach its dominant position until much more recently). In this sector and at that time, public relations was distinctive and it was valued. Media relations was a well regarded specialism (and British technology journalists were notoriously challenging so there was no room for complacency). PR looks less special and less distinctive today. Fewer people will build a career based on their media contacts and I’d advise graduates to look more broadly for roles from ‘content marketing’ to ‘corporate communication’. Today when people talk about working with influencers they rarely mean journalists. That said, media relations is still an asset in the world of inbound or digital marketing since Google has been quick to penalise other SEO tactics. In these circles, media relations is shaking off its reputation for spam and returning to the idea that it’s about relationships. One more change. When I joined the Institute of Public Relations, it was the only professional body representing individual practitioners. I felt this was an important professional step – and am still proud to profess my membership. The PRCA was then a trade association representing large consultancies and had been my natural network in earlier consultancy roles. Today, I’m also an individual member of the PRCA – now renamed as the Public Relations and Communications Association. It used to be easy to explain the difference between the two organisations, but it’s much less clearcut today. I have dedicated thirty years to public relations and tend to hold to the ‘stronger together’ argument. But others prefer to define their role as internal communication or public affairs or analyst relations – anything but public relations, it seems. Can the union hold? Today's news that the PRCA now welcomes individual members is not a surprise. The PRCA's competitive moves onto the CIPR's territory have been clear for some time. "We support healthy competition and we believe – as we have said repeatedly – that there is a role for a trade body representing consultancies and a Chartered body representing individual members. We have consistently maintained that it is in the interest of the profession to work together to promote professionalism, standards and public understanding of what we do. It is for this reason that we believe the PRCA’s announcement does not represent a step taken in the best interests of the profession." I also support competition, but recognise that in some fields representation is better served by a single voice. Would workers be better served by joining two trades unions claiming to represent their interests, or one? Would one or two be a more powerful lobbying/negotiating force? There are some 60,000 people in UK public relations roles. Scarcely a quarter of these are members of either the CIPR or the PRCA today. The professional project demands more members and a clear voice for the profession. We had one body from the late 1940s to the late 1960s (the then Institute of Public Relations). The PRCA broke away in 1969 when consultancies felt they needed stronger representation. For four decades we have had a professional body representing individual practitioners (now the CIPR) and a trade association representing PR consultancies (the PRCA). Equally, there used to be trades unions representing boilermakers among many other specialist trades. Now there are general unions like GMB and Unison. I would prefer to see one PR representative body in the UK – and still predict it will have to happen by negotiation. If need be, it will happen by the choices of thousands of members. I already pay my subscription to the CIPR. I'm publicly supportive (but willing to air my criticisms of the body in private). I'm going to keep this membership, so the question for me is should I pay an additional £100 to join the PRCA. My answer today is no. If everyone makes a positive decision one way or another, the outcome will be one of these bodies emerging stronger than the other. It will take longer than a negotated outcome – and will be more expensive – but it will lead to the same result. Vote with your wallet.